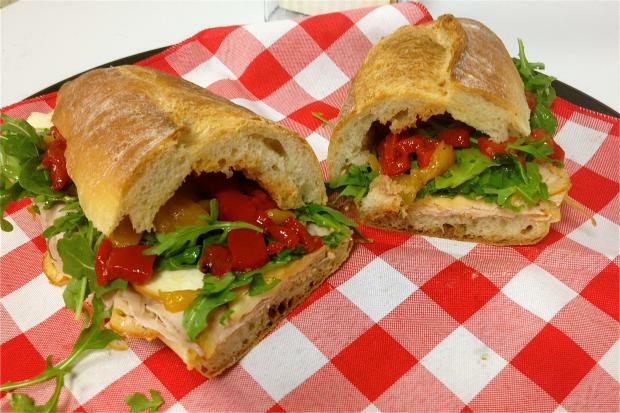 FINANCIAL DISTRICT — A new sandwich shop on Nassau Street is bringing the flavors of an authentic Italian salumeria, or deli, to the Financial District. The sandwiches served in the small, simple storefront at 97 Nassau St. start with long rolls that are sliced in half and packed with cheeses like smoked or fresh mozzarella, Italian deli meats including prosciutto, sopressata or mortadella and often some greens, such as arugula, with an added kick from roasted peppers, artichokes or sun-dried tomatoes. And while most American think of a “panini” as a hot-pressed or grilled sandwich, Antonella said that in Italy, panini simply means “sandwiches”— and all of Pisillo’s massive panini are served cold. The 25 made-to-order sandwiches range in price from $8.50 to $11.90. The couple, who moved from southern Italy to Bensonhurst seven years ago, also run a company that imports Italian products — most of which they'll be using in their sandwiches, Nazzaro said. The fresh-baked bread, however, is from Royal Crown Bakery in Bensonhurst, an Italian bakery. The sandwich shop is named Pisillo for Carmelo's grandfather, who owned a cafe and salumeria outside of Naples. "We have a history of serving people good food in our family," Carmelo said. "It's a tradition we're excited to bring here."